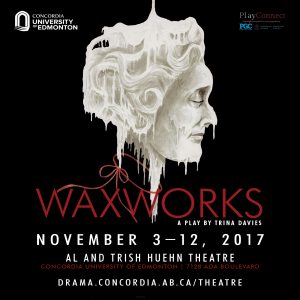 Concordia University of Edmonton’s THEATRE AT CUE announces their first production of the 2017/2018 academic year: WAXWORKS by Governor General Award winning playwright TRINA DAVIS. Betty Award winning director GLENDA STIRLING directs the first Canadian workshop production of WAXWORKS, which will run NOVEMBER 3 – 12, 2017 at the AL AND TRISH HUEHN THEATRE. WAXWORKS is an exploration of the tales we are told, the heroes and villains we create — and the life of an extraordinary artist who developed the first worldwide brand in entertainment history. It’s 1789; the edge of the French Revolution, and a young Madame Tussaud (MARIE GROSHOLZ) is recalled from her post at the Palace of Versailles back to Dr. Curtius’ Wax Salon in the heart of Paris. Reunited with her mother and her mentor, she is introduced to the most influential persons in Paris, including Maximilien Robespierre, who takes a particular interest in her art. As the revolution descends into shadow, Marie is forced to confront the remains of those she has befriended – whose waxen images must be set with signs that identify them as ‘patriots’ or ‘enemies’. WAXWORKS features student performers and production crew from the Concordia Community including: LAILA ASLUND, TOMIDE BAMIGBOYE, TYLER DeWACHT, JOEL DINICOLA, RILEY FRAZIER, KYRA LABOUCAN, KAELI MASK, JESSICA PENHALE-LAXSON, AIMEE RANDALL, DAVID SELWOOD, ALEXA LAROCQUE, BRADLEY GAMBORSKI, AND BAILEY WOZNIAK. Costumes are by BETTY KOLODZIEJ, who recently created the costumes for CUE’s URINETOWN as well as many other productions in Edmonton with Concordia and Opera Nuova. Sound design is by the Montreal-based LOUISE CAMPBELL, the production design is by Concordia’s multi-talented Technical Director and resident special effects guru, JOSIAH HIEMSTRA. The show is stage managed by MEGAN VICKERS. CUE student IESHA McLEAN is the assistant director. $20.00 Regular | $15.00 Students & Seniors. SATURDAY NOVEMBER 4TH at 4 PM, a free public reading and Q & A by playwright TRINA DAVIES with ASL INTERPRETATION from her new play SILENCE, which is set to premiere at The Grand Theatre in London, ON in 2018. At the AL AND TRISH HUEHN THEATRE .